There are many decisions to make in relation to your wedding day, from the color scheme to the cake flavor. The cherry on top is that there are plenty of other decisions you will have to make that will have a long-lasting impact on your life, such as whether or not you will be changing your last name. Modern couples are choosing to buck tradition in unique ways when it comes to changing names after the wedding day, from men taking their wives' names to both parties hyphenating their names, to combining both partners' last names and more. 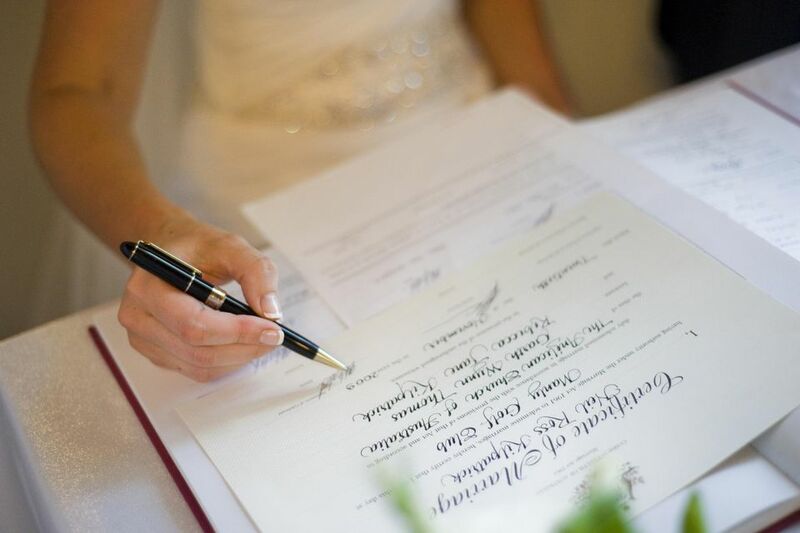 No matter what you decide, if "name changes" is on the list of plans for yourself or your spouse-to-be, you will want to consult with a comprehensive name change checklist to ensure that everything is properly and legally updated. The process of changing your name is simple with some guidance. If you or your spouse decide to change your name, there is a list of to-do's to update with your new name as a result. Our name change checklist below is a simple tool to help you keep track of who you have informed of your name change, and who you still need to inform. After you've read about the process of changing your name, use this name change checklist to help you stay organized, and print it out if needed. Social Security Administration. This is where you get a new social security card. Department of Motor Vehicles. Get a new driver's license, car title, and registration. Voter Registration. Some states allow you to change voter registration at the DMV. State Department. Update your US Passport with your new name. Likely, you will want to take advantage of your work perks and benefits including retirement contributions, health insurance and more. The sooner you update your name, the quicker this transition will start. Your Employer. Make sure you update your W2 forms, 401k, health insurance, life insurance, employee benefits, email, business cards, nameplate, work website and other work-related materials. Unions and Professional Organizations. Notify any professional certification boards including the State Bar and professional licenses. Personal Professional Website. This is especially important for freelancers. To cash your paychecks and access your assets, your government-issued photo ID should match your banking credentials, especially if you want to access your money. Protecting your property is one of the best reasons you should be diligent with following through completely if you decide to change your name.